Striker Will Grigg's absence because of international duty is a disappointment but Wigan Athletic can cope without him, says manager Gary Caldwell. 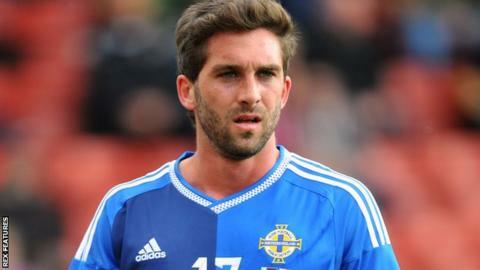 Grigg, 24, was in the Northern Ireland squad that booked their Euro 2016 spot in Thursday's 3-1 win against Greece. He has three goals in nine games for Latics but misses Saturday's derby with Bury while with Michael O'Neill's side. "He was the main striker I wanted in the summer, not to have him is a blow," Caldwell told BBC Radio Manchester. "But we coped before at Chesterfield, we scored three goals that day and we've got a squad that's more than capable of coping in his absence." Northern Ireland ended a 29-year-wait to reach a major finals with the qualification, and Caldwell hopes the success will galvanise Grigg on his return to the DW Stadium as the Latics attempt to improve on their current ninth place in League One. "It's fantastic, an amazing achievement for Northern Ireland, O'Neill and everyone connected to qualify for the tournament with a game to spare," he said. "Will will be on a high and hopefully he can bring that positivity to his form and his performances here."